Earlier, I told you that we hosted our latest Supper Club at our house. Since it was an English theme, we had to end the meal with chockies - that's just what one does. 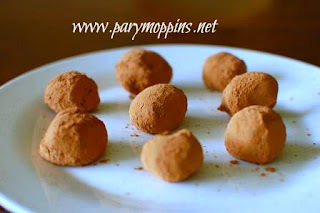 I decided to tackle making simple truffles instead of buying chocs in a box; they seem much more impressive than they actually are. Love it. We really like dark chocolate and that rich, bitter taste that goes with it which is why I like a touch of cinnamon and coffee with almost everything I make that is chocolaty. It adds to the richness. While cream is heating, dump chocolate chips in a heatproof bowl. In another bowl, mix instant coffee powder with vanilla. Once the cream reaches a rolling boil, turn off heat and pour over chocolate chips. Stir with a whisk or fork until chips are mostly melted. Pour vanilla/coffee mixture into chips and keep stirring. If your chips are not fully melted, put the bowl over a saucepan of boiling water for a few minutes to make sure the mixture is smooth. Cover with a tea towel and leave the bowl on the counter to cool. Once the bowl has cooled, put the ganache in the fridge to harden. Put about a 1/4c. of cocoa powder and a 1/2 tsp. cinnamon in a bowl and mix. After your chocolate has hardened, take it from the fridge and scoop with a melon baller into the powder and roll to cover. 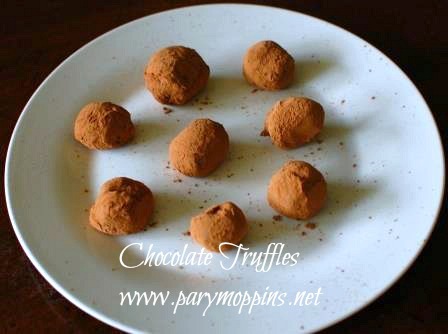 The truffles will be soft so it is recommended to leave them in the fridge until ready to serve. *You can mix semi-sweet and milk chips but I wouldn't go more than half with the milk chocolate chips. In this recipe, I used 3/4lb. semi-sweet and 1/4lb. milk chips.